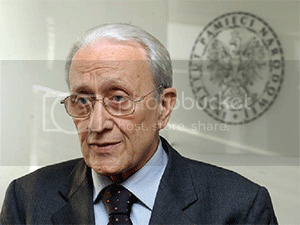 Ferdinando Imposimato is the Honorary President of the Supreme Court of Italy and a former Senator who served on the Anti-Mafia Commission in three administrations. He is the author or co-author of seven books on international terrorism, state corruption, and related matters, and a Grand Officer of the Order of Merit of the Republic of Italy. The reports of the National Institute of Standards and Technology (NIST), November 20, 2005, set forth the following conclusions: The airplanes that struck each of the Twin Towers caused a breach as well as an explosion evidenced by a giant fireball. The remaining jet fuel flowed onto the lower floors, sustaining the fires. The heat from the fires deformed the building structures and both towers collapsed completely from top to bottom. Very little that was of any size remained after these events except steel as well as aluminum fragments and the pulverized dust from the concrete floors. World Trade Center 7 also collapsed--in a way that was inconsistent with the common experience of engineers. All three buildings collapsed completely, but Building 7 was not hit by a plane. WTC7’s collapse violated common experience and was unprecedented. The NIST report does not analyze the actual nature of the collapses. According to experts at the Toronto Hearings (Sept. 8-11, 2011), the collapses had features that indicate controlled explosions. I agree with architect Richard Gage and engineer Jon Cole, both highly experienced professionals [from Architects & Engineers for 9/11 Truth – now numbering 1,700 strong], who have arrived at their conclusions through reliable tests, scientific proof, and the visual testimony of people above suspicion, including firefighters and victims. The authoritative theologian David Ray Griffin has described very precisely why the hypothesis of controlled demolition should be taken into consideration. Various witnesses heard bursts of explosions. According to NIST the collapse of Building 7 was due to fires provoked by the collapse of the twin towers. Chemist and independent researcher Kevin Ryan, however, has demonstrated that NIST gave contradictory versions of the collapse of Building 7. In a preliminary report NIST declared that WTC7 was destroyed because of fires provoked by diesel fuel stored in the building, while in a second report this fuel was no longer considered the cause of the building’s collapse. Additional comments on the NIST version of events have been made by David Chandler, another expert witness at the Journal of 9/11 Studies Letters, September 2012 Toronto Hearings. Despite NIST’s claim of three distinct phases of collapse, Chandler pointed out that many available videos show that for about two and a half seconds the acceleration of the building cannot be distinguished from freefall. NIST has been obliged to agree with this empirical fact as pointed out by Chandler, and now understandable by everyone. "Recognizing that such grave crimes threaten the peace, security and the well being of the world,"
"Affirming that the most serious crimes of concern to the international community as a whole must not go unpunished and that their effective prosecution must be ensured by taking measures at the national level and by enhancing international cooperation, "
"Determined to put an end to impunity for the perpetrators of these crimes and thus to contribute to the prosecution of such crimes, Recalling that the duty of every state to exercise its jurisdiction over those responsible for international crimes, … "
Joe on Tue, 11/20/2012 - 6:39pm.